Armor of Light was released April 27, 2018 with production duties handled by producer whiz Chris “The Wizard” Collier (Korn, Prong, Flotsam and Jetsam, Metal Church, Dokken, Slipknot etc) under the Nuclear Blast label and under the Ward label in Japan. Armor Of Light is the follow up to the highly acclaimed come-back record “Unleash The Fire” which entered the Hard Rock 100 Billboard charts at 75 with Rolling Stone Magazine giving it a 4 out of 5 and most media including Burrn! Rock Hard and Aardshock calling it album of the year! 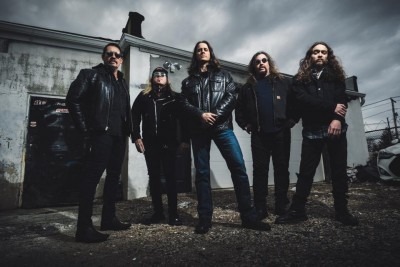 Long time members Don Van Stavern, Mike Flyntz, vocalist extraordinaire Todd Michael Hall, skin basher Frank Gilchriest and guitar whiz kid Nick Lee feel this next offering will please long time fans and create new ones as the material is fresh and power metal at its finest in the traditional stylings of this era of RIOT. THIS WILL MAKE YOU RIOT! Through the storm of life's obstacles the guys successfully continue to raise the flag in honor of the RIOT legacy of music, fallen band mates and the fans who have been demanding RIOT for years. This new onslaught headlined sold out shows in Germany, Greece, Spain and Italy and rocked the prestigious festivals Sweden Rock Festival (Sweden), Rock Fest Barcelona (Spain), Loud Park (Japan), Keep It True, Metal Assault, Headbangers Open Air (Germany), Fall of Summer (Paris), Metal Apocalypse, Bang Your Head with Twisted Sister/Anthrax, Metal Days with Megadeth/Volbeat, two appearances onboard 70,000 Tons of Metal Cruise and top it off with appearances with Judas Priest, Motley Crue, Def Leppard and, Journey to name a few! RIOT V just headlined this years Skulls of Metal Festival (Spain), Blast from the Past Festival (Belgium) and appearances at Bang Your Head 2017 (Germany) and will do one last Europe Tour in early December! 2018 saw RIOT V headline Germany’s Headbangers Open Air as well as appearances at Loud Park 2018 (Japan), Rock Fest Barcelona and Leyendas del Rock 2018 (Spain) a tour of the UK and many more tour dates! With reissues on Sony, EMI & Metal Blade, RIOT are consitently on radio and metal charts worldwide, as well as being a part of New York City's Top 20 Most Influential Metal Bands, 100 Best Metal Albums of All Time, 100 Best Metal Bands of All Time and numerous mentions on VH1’s That Metal Show with Eddie Trunk and staff sighting RIOT as one of the innovators of Metal music in America and beyond! RIOT truly are Metal Soldiers and will keep marching and fighting the good fight to bring you the music you’ve come to know, love and expect from RIOT V.....Shine On!